You can make your City Nature Challenge as simple or as engaged as you wish. You can spend just a few minutes taking a picture or attend a pre-event training or take pictures multiple days of the event or do it all. Activities related to the Twin Ports City Nature Challenge are listed below. Join the competition among cities and regions nationwide. 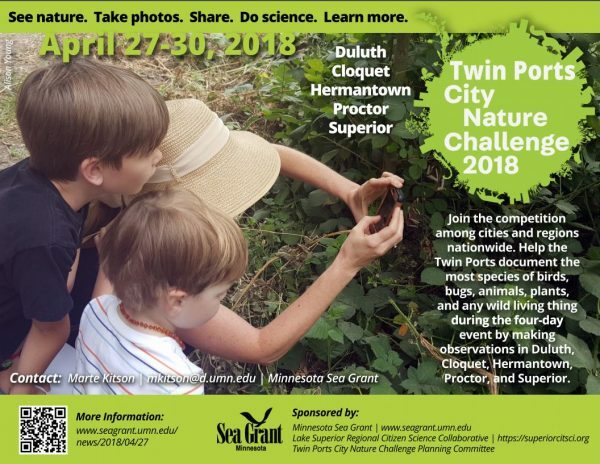 Help the Twin Ports document the most species of birds, bugs, animals, plants, and any wild living thing during the five-day event by making observations in Duluth, Cloquet, Hermantown, Proctor, and Superior. Why do this? The data collected each year from lots of different places can be useful for scientists and planners if collected the same way for many years. What: Three hour symposium connecting regional researchers, educators and citizens looking to share ideas and develop collaborations around citizen science. Who should attend: Researchers, educators and citizens interested in citizen science in Northern MN.